KOFFEE WITH KIRU: happy CNY's eve! A SURVEY has found that a number of Singaporean girls wash their bras only once a week, Sin Chew Daily reported. Some never washed them at all, the daily said, quoting a survey carried out by a news portal. More than 200 women took part in the survey. It said that as of Feb 9, 108 respondents said they washed and changed their bras everyday but 42 others said they only changed them once a week. Another six said they washed their bras once a year while six others said they never washed their bras. The daily quoted the online news writer as saying he was surprised with the level of cleanliness among Singaporean girls. “Although some women work in an air-conditioned environment and may not sweat so often, the skin will still turn oily after some time and this will result in body odour. It is thus more appropriate to change the bra every day,” he said. However, a gynaecologist said it is not necessary for women to change their bras every day especially if they work at the office. > like seriously...what is wrong with some of the GIRLS in singapore??? they don't wash their bras?!!!eww...@@.. yes, there are people who work in the air conditioned environment but hey! there are chances to sweat no matter what! when you walk from the parking lot to the office? when you walk to your office from the train station? even when you are walking to wherever to have lunch! there are MILLIONS of chances to get sweat!!! > and even if you don't sweat, like what the news above stated, your skin still turn oily and can cause body odour. 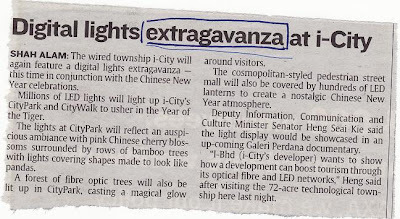 > i didn't know what does EXTRAGAVANZA means in the first place, therefore i went to check dictionary and uh oh, no such word, then in the end, michelle told me it was extravaganza and NOT extragavanza.. so, what do you think about this?